Gorilla Forest Camp is situated in Bwindi Impenetrable National Park, a world heritage site. 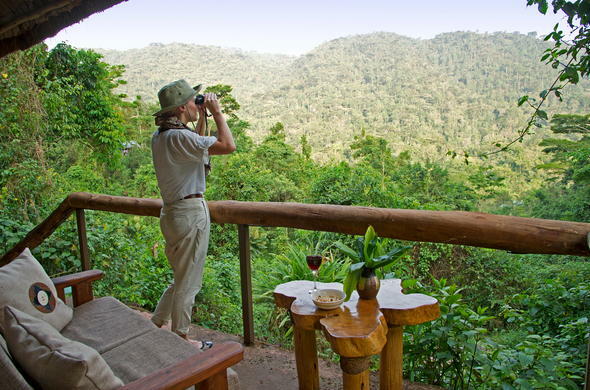 Gorilla Forest Camp is a luxury tented camp perched on the side of a mountain in the Bwindi Impenetrable National Park. It overlooks the park in southerly direction, and is the ideal base for Gorilla tracking and birding excursions in the park. Bwindi is a UNESCO World Heritage Site, and is the natural habitat for just over half the world’s last surviving population of Mountain Gorillas. The Gorilla Forest Camp is 522km away from Kampala by road - at least a 10-hour drive. The tarmac portion of the road passes through Lake Victoria basin until Kabale, 6 hours away from Kampala. Here, it changes to a dirt road that hairpins for 3 hours up and down the eastern edge of the Albertine Rift Valley. The camp is one to 1.75 hours away from Entebbe by light aircraft. Aircraft land at the Kayonza airstrip, 25km (40 minutes) away from the Gorilla Forest Camp. The Airstrip can take aircraft carrying a maximum number of 6 clients. For larger groups, we use the Ishasha airstrip 65km (2 hours 30 minutes) away on rough tracks. Bwindi Impenetrable National Park is an enduring pocket of a huge primeval forest that once stretched from the Virunga Volcanoes in the South to the Rwenzori Mountains in the North. The fertile 331 square kilometres of the park contain 113 species of mammals (including a herd of the rare Forest Elephant), 200 species of butterfly, over 360 species of birds and a prodigious 324 tree varieties (10 of which are endemic to the park). In addition to this incredible diversity, Bwindi is home to seven species of primates,attracting the attention of international conservation efforts, of which the most endangered is that elusive giant of Africa-- the Mountain Gorilla. Only 600 of these magnificent animals remain worldwide, and Bwindi is home to just over half of them. Bwindi Impenetrable National Park is a huge primeval forest that once stretched from the Virunga Volcanoes in the South to the Rwenzori Mountains in the North.